Bangkok’s Platinum Fashion Mall can be daunting for newbies (See Bangkok’s Platinum Fashion Mall For Newbies). That’s why we’ve put together this list of 10 tips of how to survive a day of shopping at this wholesale paradise. 1. Arrive early and plan for an entire day. Even if you don’t shop the full day, recovery is key and you’ll need a few Chang’s to decompress afterwards. Fashion mall hours can be found here. The mall starts getting busier around 2:00 when fashion conscience Thai teens start getting out of school. 2. If you see something you like, buy it! Don’t wait. Buy it immediately or you’ll never find it again! I once spent two hours looking for a jewellery shop that I had planned to come back to later. Thankfully I found it, but the following year it had changed locations! With 2500+ stores, don’t take the risk. 3. The more you buy the cheaper the price. The mall is labeled as a “wholesale” mall, meaning they want you to buy more than one item in order to get the wholesale price. The idea is if you are only buying one piece you’re not buying it to sell to others and therefore you are expected to pay the normal price. Always ask what the price will be if you buy 2, 3, 4 items…. 4. “No can try”. It’s literal. 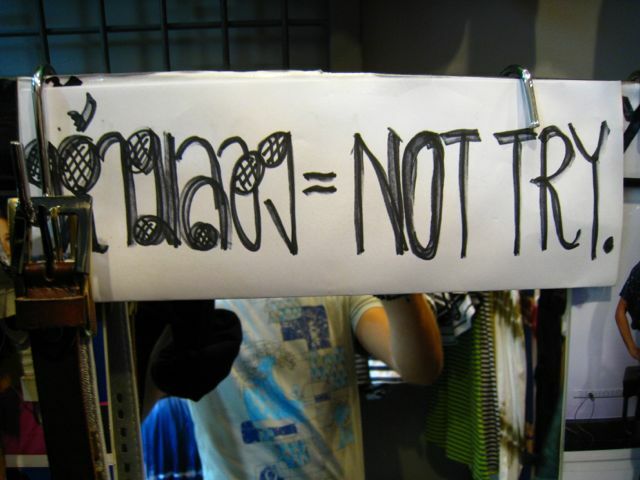 It actually means, you can’t try it on. No ifs ands or buts. 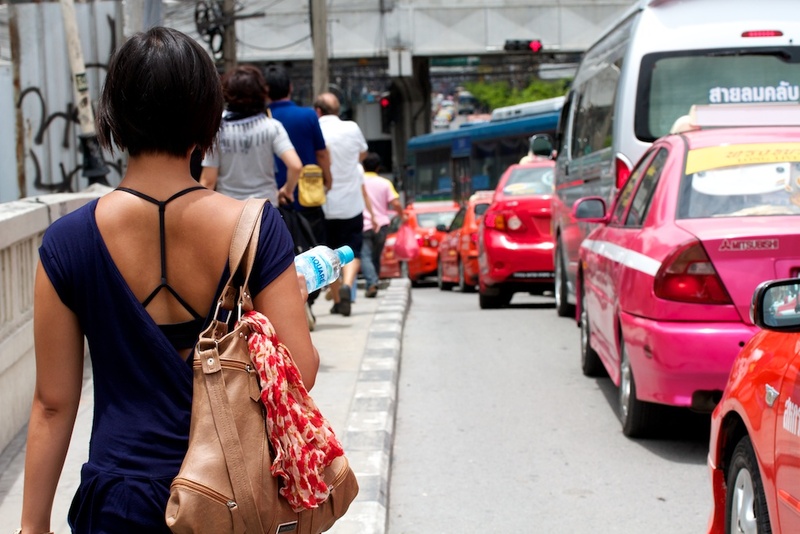 Luckily for us Westerners, the Thai’s have this wonderful, new age fitting system called an elastic. If you’re wondering what the apparel will look like on a human body, almost every garment comes with a picture of a Thai teen modeling the item. **Note: We’re starting to get a better understanding of this “no try on” deal, and believe that if an item comes in more than one size, then it’s ok to try it on. Though this is rare in women’s apparel at the mall, other than shoes. 5. “Is this going to fall apart in the wash?” If you’re looking for quality this mall isn’t for you. Don’t even bother worrying about this. If you’re looking for that fantastic one of a kind item that people will compliment you on time and time again, you’ve found gold! Be kind, don’t complain, and appreciate the fact that you’re paying at most 10-15 dollars per item and if you get at least ten wears and eight compliments, you’ve found yourself a pretty awesome deal. 6. Step-by-step, Little-by-little. 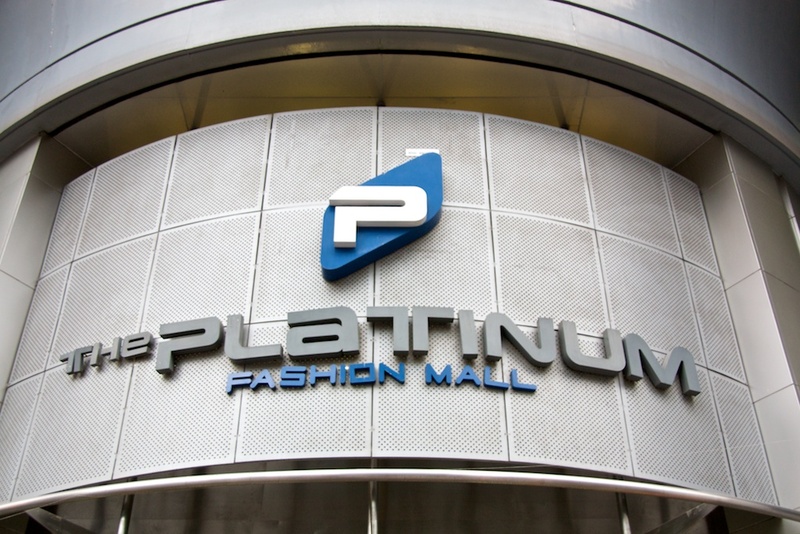 If you look at the Platinum Fashion Mall as a whole, you’re bound to feel overwhelmed. There is no way you can visit every single shop and see every single item in a day and walk away with some new clothes. If you live in the future you’ll have no luck. Look at what’s in front of you and move on. If the store doesn’t appeal to your style, try the shop beside it. No point wasting time looking for that needle in a haystack, because there is definitely something for everyone. 7. Bad at making decisions? That needs to change! It’s either you start becoming more decisive, or drag along your poor significant other and get them to do the decision making. Luckily for me, I have one of those and he’s absolutely wonderful. Do you want blue or green? Sparkles or no sparkles? With or without flowers? Do I need dresses or shirts? Gold or silver jewellery? Birds or bows? Decisions, decisions, decisions. It could make or break you, so start practicing now. 8. Take a break. Luckily for you the mall boasts an incredible food court. Unfortunately, I can’t speak of this food court from personal experience. Eating takes time, and a food court has too many options when I’m already at my breaking point on decision making (see Tip 7). 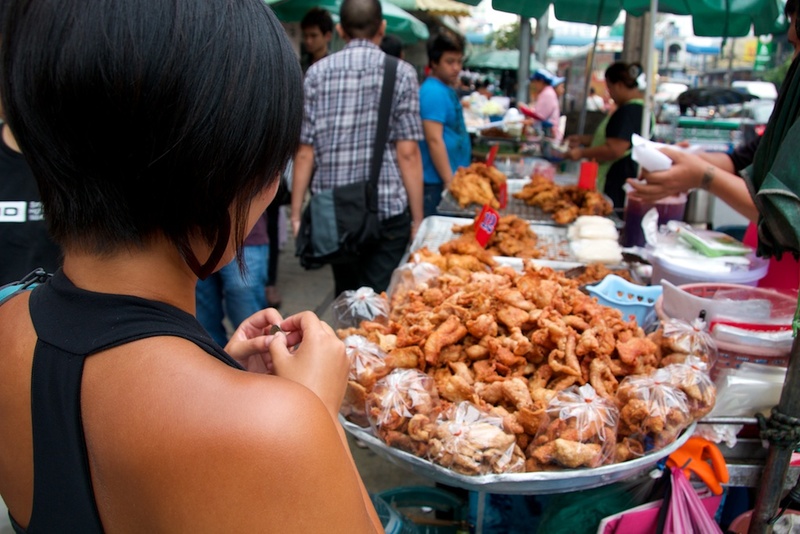 When the hunger hits, my main act of defence is to run out of the mall and visit a street vendor. Fried chicken? Done. Then, run 30 seconds to the nearest 7-Eleven (Read: 5 Reasons Why We Love 7-Eleven in Thailand) and grab some refreshments. A cold water or an iced tea can do wonders to revive your energy and you’ll save yourself a couple of bucks that can easily be spent on another shirt. 9. Make room in your luggage…or…buy a bag! In order to make your day worthwhile, you’ll need to get enough stuff so that you’re practically forced to buy another bag. It also helps make you feel more like a local and less like a tourist. If you’re concerned you don’t have enough room in your luggage, you can easily purchase a canvas bag from the lower level. Problem solved! 10. Thank whoever you’re with profusely, with compliments, presents, kisses, and food. To sacrifice an entire day of your holiday so that you can get some shopping in, is a quality that is rare. If whoever you are with decided to stick it out and let you have your fun, make sure you reward them generously, with whatever they request (Except to forgo a day at the Fashion Mall the following year…that’s a deal breaker). I also went here myself. I’m also writing about my experience in Platinum Fashion Mall and Bangkok during my visit last July 2017. Hope you can also check it out! Shopping at Platinum mall was indeed ‘THE’ Bangkok shopping experience i’ll go back to.